AESU, the most trusted name in travel, offers unique, exciting travel programs for college students and young professionals at affordable rates. Each trip is action-packed and informal—designed just for people your own age. Our Discount Greek Vacation – Greek Island Odyssey – is an exciting nine day through fabled Greece. Delve deep into the myths and legends of ancient Greece, from tales of Hercules to the mythology surrounding the Island of Poros. 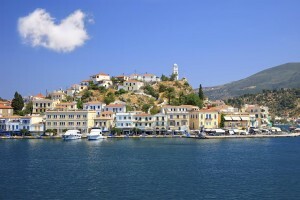 The Island of Poros, a small volcanic island-pair, is a popular summer getaway among both Greeks and tourists. Poros consists of two islands: Sphairia, where today’s city is located, and Kalaureia, the northern and largest of the two land masses. A bridge connects the two islands over a narrow strait. According to ancient Greek mythology, when the Cretan King Minos was fighting the city of Megara, the daughter of King Nisos, Scylla, fell in love with the king. To prove her love, she cut off a lock of her father’s hair – the source of his immortality – and stole the keys to the city gates, both of which she gave to King Minos. When the city had fallen, the king rejected Scylla and returned to Crete. Incredibly heartbroken, Scylla swam after King Minos, trying to keep up with his ships before finally succumbing to exhaustion and drowning. To this day, the spot where Scylla drowned is known as Cape Skyllaio or Cape Skili. The Greek god Poseidon, the god of the sea, gave Apollo, the god of the sun, the city of Delphi to in exchange for Poros, the future sit of the Temple of Poseidon. The temple was constructed in 520BC. Poros is also said to be the birthplace of Poseidon’s son Theseus, who is most famous for slaying the Minotaur on the Island of Crete. Click Here to book your Greek getaway with AESU! If you have any questions about booking your Discount Greek Vacation, please contact AESU by calling 800-638-7640 or fill out the contact form found on our website. And don’t forget to check out all of our great Travel Tips, especially the Travel Tips for Europe, before you head overseas. This entry was posted on Thursday, August 14th, 2014	at 3:49 pm	. You can follow any responses to this entry through the RSS 2.0	feed. Both comments and pings are currently closed.